Retired in 2009 and replaced by the Air Force CV-22 version of the V-22 Osprey, helicopters of the MH-53 PAVE LOW series are extensive modifications of the CH-53 Sea Stallion used as a heavy transport helicopter by the United States Marine Corps and the HH-53 search and rescue helicopter. 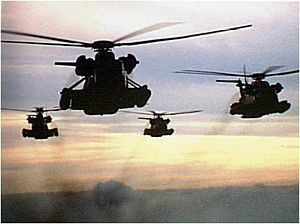 PAVE LOWs, in the MH-53J or M versions, can fly long-range, very low level, special operations missions in night or day, and in adverse weather, as single aircraft or in formations. Their main role is infiltrating, exfiltrating, and resupplying special operations forces on the ground, but they have also led more heavily armed AH-64 Apache attack helicopters to their targets. Ground forces carried typically have special reconnaissance, direct action for raids, or unconventional warfare missions. PAVE LOWs can be air refueled, especially by MC-130 COMBAT TALON aircraft with even more advanced C3I equipment; one or more MC-130s may shepherd a formation of MH-53s, as well as other mission-specific aircraft such as AC-130 fire support aircraft. The basic suite includes terrain-following/terrain-avoidance radar, forward-looking infrared (FLIR) viewing, inertial navigation coupled with GPS, and a moving map display. Flight crew can wear night vision goggles. When earlier aircraft, such as the HH-53 or MH-53E were upgraded to version M, the major enhancement was the Interactive Defensive Avionics System/Multi-Mission Advanced Tactical Terminal (IDAS/MATT). This system greatly enhances present defensive capabilities of the Pave Low. It provides instant access to the total battlefield situation, using near real-time electronic Order of Battle updates. It also provides a new level of detection avoidance with near real-time threat broadcasts over-the-horizon, so crews can avoid and defeat threats, and replan en route if needed. Additional communications gear, including the AN/ARC-210 SINCGARS-compliant and AN/ARC-187 HAVE QUICK II compliant radios, has been added. In the M model, the defensive electronics build on those of the J model. There are now active electronic (e.g., jamming) and infrared defensives. To improve situational awareness, all the threat and countermeasure information is on a single display. The software will give immediate recommendations for avoiding or countering the threat. The infrared countermeasures was not limited to flares, but directed energy from the AN/ALQ-157 system. 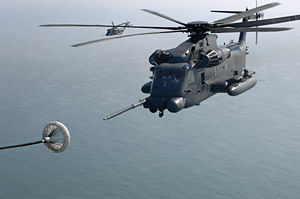 M models can carry up to 37 troops or hook load a charge of up to 20,000 pounds.<GS-MH53M). The Air Force plans to replace them with the CV-22 special operations variant of the Osprey tilt-rotor aircraft. Confusingly, United States Marine Corps Ospreys in the regular combat transport role are designated MV-22, the "M" being the prefix for special operations aircraft, while the Air Force models, assigned to Special Operations, have the "C" prefix for cargo aircraft. This page was last modified 07:20, 25 October 2013.